The juxtaposed documents in and of themselves reveal a number of red flags. How does one “revise” a chain-of-custody”? If you do a google search you will not find “chain-of-custody” as an object of the verb revise. It is an oxymoron. A document or opinion can be revised. 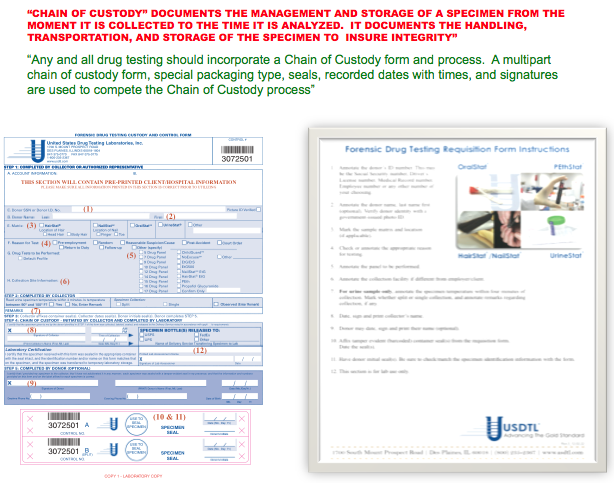 A chain-of-custody, by its very definition, cannot. This collusion to fabricate a positive test has coined a new oxymoron—“revised chain-of-custody.” Go ahead and look it up. It is a novel one. As it should be. 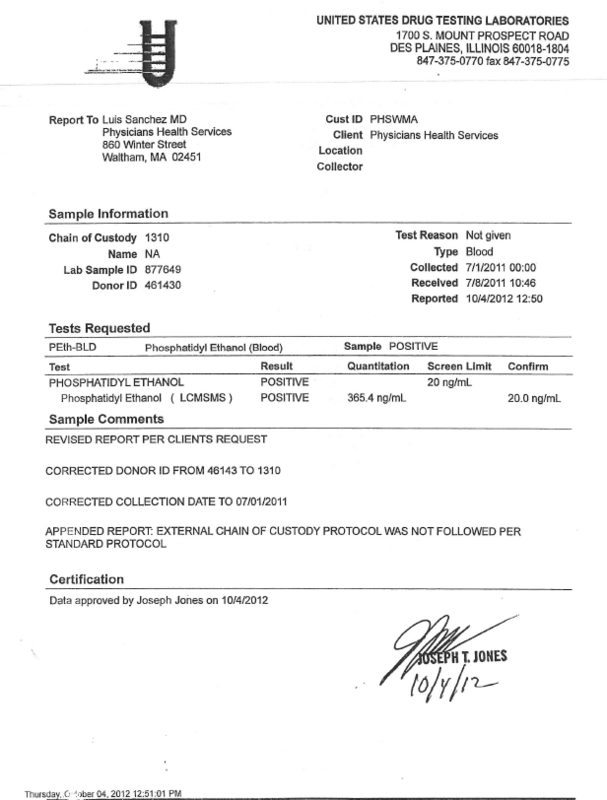 The second document, addressed to Dr. Luis Sanchez, is dated October 4, 2012 (67 days earlier) and shows the first document to be a bald-faced lie. 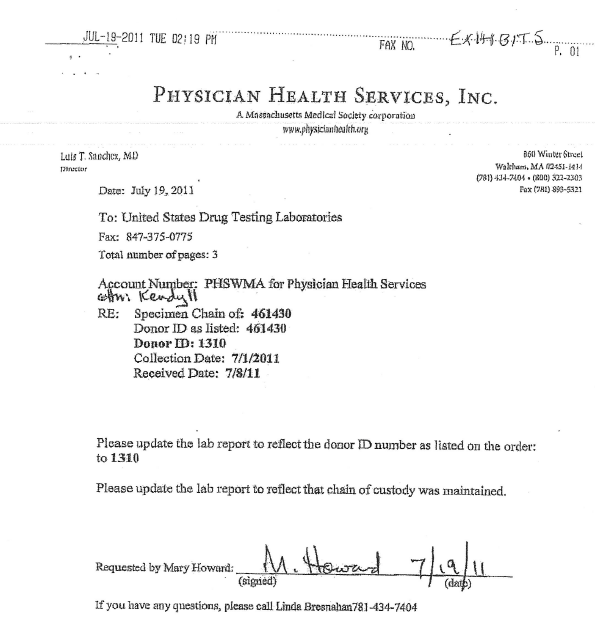 On July 28h 2011 Dr. Luis Sanchez reported to the Medical Board that I had a positive alcohol test. I was finally able to get a copy of the “litigation packet” in December of 2011. Remarkably, it showed that Sanchez had requested my ID # and a “chain-of-custody” be added to an already positive specimen. I reported this to the Board but they ignored it. I also filed a complaint with the College of American Pathologists. 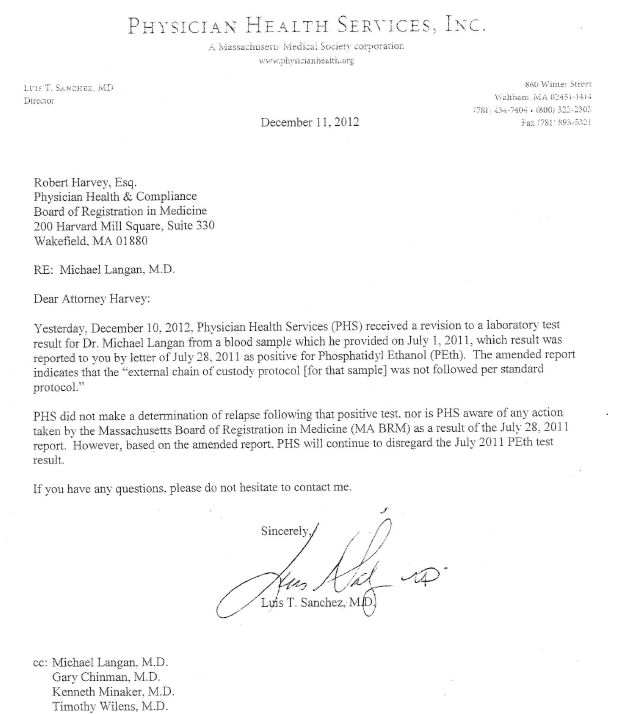 On October 23, 2012 Sanchez reported to the Medical Board that I was “noncompliant” with requirements with A.A. meetings that I was supposed to go to as a direct result of the positive test and my license to practice medicine was suspended as a result in December 2012. 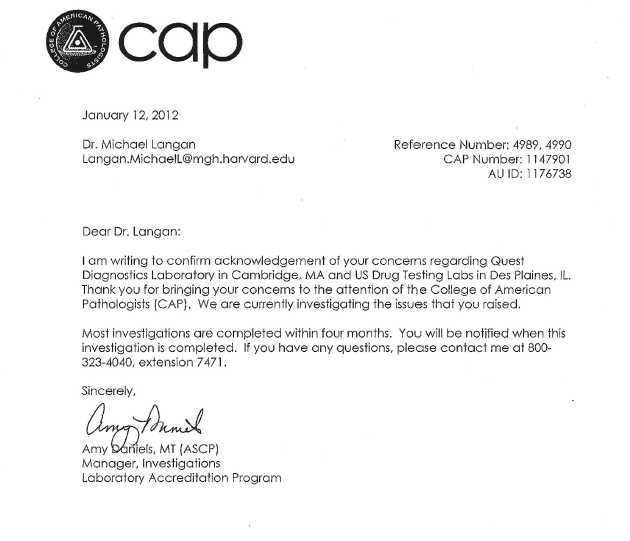 On December 10, 2012 I contacted the College of American Pathologists who told me the test was “amended” from “positive” to “invalid” on October 4, 2012. I confronted Sanchez and PHS and they said they did not know anything about it. Please note again that Dr. Sanchez stated on December 11, 2012 that he “just learned” about this on December 10, 2012. He reported me to the Board as “noncompliant” on October 23, 2012 and my license was suspended in December 2012. These documents show he had full knowledge that the test was invalid and as an agent of the Board this is under “color of law.” Both he, and PHS, need to be held accountable for this. The contradictory documents from Sanchez alone constitute a crime (withholding information in concealment and providing false information to a state agency). But what he did is far far worse. I just obtained the October 4th document. Although I knew it existed, PHS suppressed it and refused to acknowledge it. 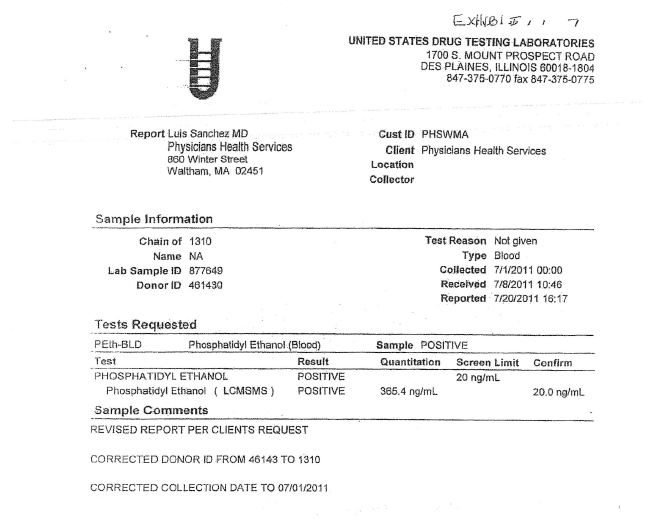 But in response to a complaint I filed against PHS and the labs it was revealed by USDTL that the test in question (phosphatidyl-ethanol) was not sent as a “forensic” specimen but collected as a “forensic” specimen, then changed to a “clinical” specimen at the request of PHS Program Director, Linda Bresnahan. 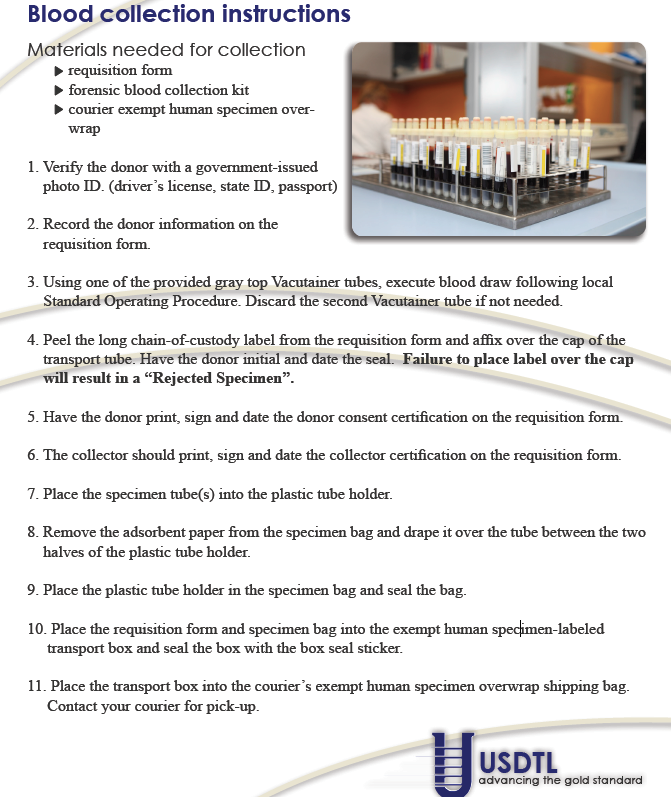 The specimen was kept at the collecting lab (Quest) for 7 days as a “clinical” specimen, then sent to the analyzing lab (USDTL) with specific instructions from Quest to process it and report it as a “clinical” specimen. PHS then used it as a “forensic” specimen by reporting me to the Board of Registration in Medicine and requesting I undergo an evaluation for alcohol abuse. As a “clinical” specimen it is rendered “Protected Health Information” (PHI) and thus under the HIPAA Privacy-Rule. So with the help of the College of American Pathologists I requested my PHI from both Quest and USDTL. Quest refused (for obvious reasons) but USDTL complied. 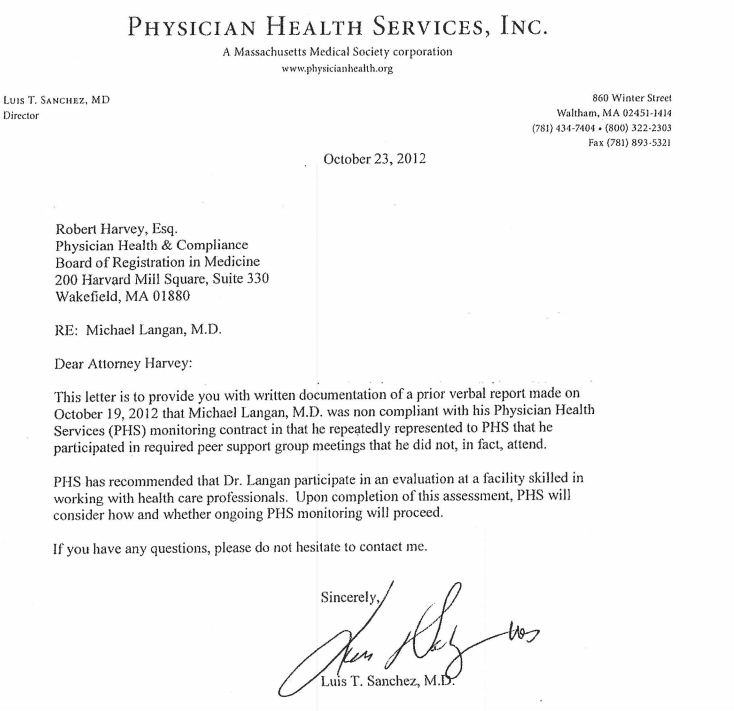 And that is how I was able to obtain the October 4th document revealing that Dr. Sanchez lied to the Medical Board. I would love to hear him, or PHS MRO Wayne Gavryck, defend the indefensible (and unconscionable). Dr. Sanchez is correct when he pleads ignorance of any action taken by the Board as a result of the July 21st PEth result. It was his report to the Medical Board that I was “noncompliant” with attending AA meetings (that I was supposed to go to as the direct and sole result of the positive test) that he reported to the Board just two weeks after the October 4th appended test. The test was sent as a “clinical” specimen intentionally. 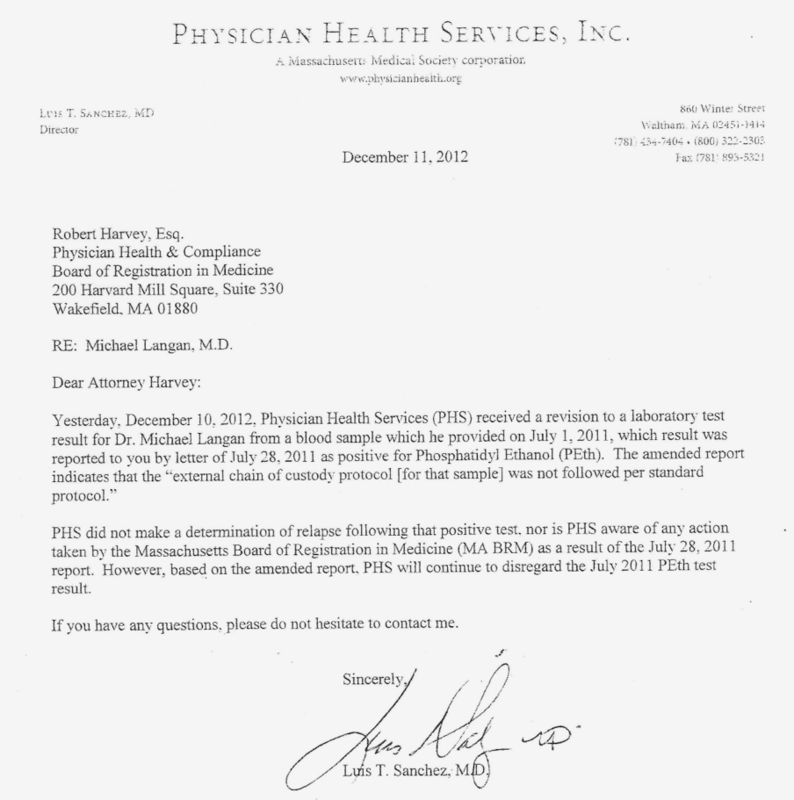 PHS is not a clinical provider but a monitoring agency. They cannot send clinical samples. But since clinical samples are “protected health information” and under HIPAA the lab had to give me the records and here you have them. 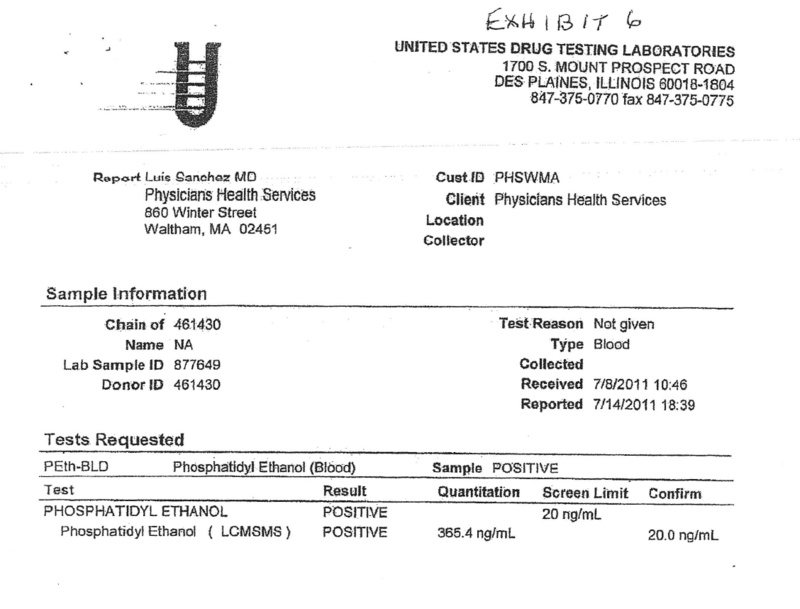 The distinction between “forensic” and “clinical” drug and alcohol testing is black and white. PHS is a monitoring program not a treatment provider. The fact that a monitoring agency with an MRO asked the lab to process and report it as a clinical sample and then used it forensically is an extreme outlier in terms of forensic fraud. The fact that they collected it forensically, held it for 7 days and changed it from “forensic” to “clinical” to bypass strict “chain-of-custody” requirements deepens the malice. The fact that they then reported it to the Board as a forensic sample and maintained it was forensic up until now makes it egregious. But the fact that the test was changed from “positive” to “invalid” on October 4th, 2012 and Sanchez then reported me to the Board on October 23rd 2012 for “noncompliance,” suppressed it and tried to send me to Kansas for damage control makes it wantonly egregious. (they didn’t think I’d ever find out). Add on that the fact that I’ve been questioning the validity of the test since day 1 and they violated the HIPAA Privacy Rule over and over and this is reckless and major health care fraud. You are brave beyond survuving a concentration camp brave. Keep up the fight. You can’t and should not try to expose and correct this abuse of power and illegal coercion into a dangerous cult religion. Your story makes me want to scream and pull my hair out and … Well let’s just say behave in a way that would not end well for the people who are trying to hurt you. This is criminal. Keep writing about it and please do reach out to me often. There has got to be measures we can take that will expose this fraud and abuse … For forcing anyone into the 12 steps is abuse of the most emotional damaging kind, whether a doctor or a garbage collector. Threatening your life and ability to take care of your family by falsifying medical tests is unethical to the extreme. Thank you for demonstrating such bravery. 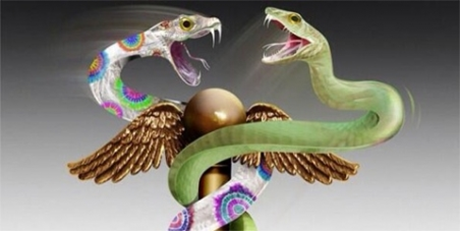 This is frightening stuff, not for the faint of heart … To the general public who has been led to believe 12 step groups are benign self-help groups when they are religious indoctrination disguised as medicine. No one is safe. Not even doctors. – It could prevent this injustice committed against other honest doctors (like I’m sure you are) in the future. Wow. He wants to help but he needs to stay anonymous. Only in a case of extreme fraud and coercion would he need to remain anonymous. Please excuse the word anonymous and all its affiliations with the cult in question. Thank you for sharing this with me. Please keep me abreast of the process of this exchange. Mr. Heller (or another attorney), may be interested in this. Lots of valid criticism being thrown his way and he can’t even respond. Armed with documentary facts and evidence base the voice of addiction medicine scatters like feral cats. Thank you. These people are monsters.